Train schedules can be found using the web site of Deutsche Bahn. Queries in English can be made here. From Braunschweig Main Station (Hauptbahnhof): take tram line 1 heading towards "Wenden"; get off at tram stop Mühlenpfordtstraße which is vis-a-vis to the Computer Science Building. Approaching from the South on Autobahn A7: take Autobahn A39 at "Dreieck Salzgitter"; after approx. 30 km, at "Autobahnkreuz Braunschweig Südwest" take A391 towards Gifhorn; follow North to exit "Hamburger Straße". Approaching on Autobahn A2: take Autobahn A391 at "Autobahnkreuz Braunschweig Nord" towards Kassel; follow signs towards exit "Hamburger Straße." From exit "Hambuger Straße": turn right onto Hambuger Straße towards city center (Stadtmitte); after approx. 600 meters turn left at traffic lights onto "Rebenring" eastbound; continue straight for approx. 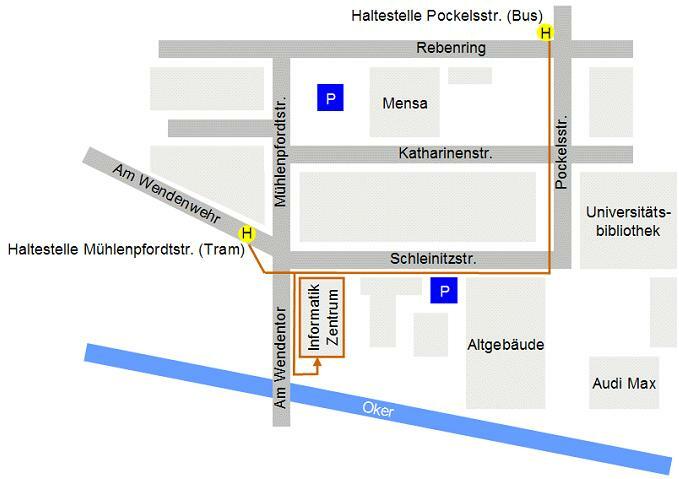 400 meters, turn right at second traffic light onto "Pockelsstraße"; turn right again at next corner onto " Katharinenstraße" (one-way street); follow street approx. 200 meters to large parking area on the right-hand side ("Parkplatz Mensa", free of charge). The Computer Science Building is approx. 100 meters to the south on "Mühlenpfordtstraße". Entrance: The Computer Science Building is the new, five-story building at the corner "Mühlenpfordtstraße" - "Schleinitzstraße". Unfortunately, it does not have an obvious/representative entrance. Instead, walk past the building to the front of the much higher Architecture tower, enter the tower's lobby and proceed to the back of the lobby. The Computer Graphics Lab is one floor up on the "Gallery Floor". The secretary's office is in the North-East corner, room G28.